In 1963 A group of men, Ed Allen, Russ Barth, Tom Fath, Bill Lavender, Don Mapes, Chuck Melicki, Wayne Malone, Jack Mayer and Manard Munson (these are the now active charter members), drew up a charter and created the Polka Dots Motorcycle Club. For a meeting place they chose the community center. Not liking to have to depend on other people for a place to ride and hold meetings, they decided to purchase there own land. So in 1967 they purchased 101 acres of river front property in midland county just 1.5 miles west of M-30 on Brooks Rd. From 1967 to 1970 their project was clearing woods, grubbing roads and digging ditches. Not the kind of work that you would expect from a motorcycle club. Instead of riding bikes and enjoying each others company, they were spending their evenings and weekends creating a place that they and their friends and families could enjoy for many years to come. In the early 1970’s Polka Dots hosted their first Motocross race on their very own club grounds. 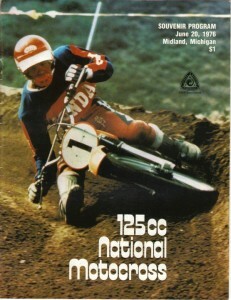 And in 1975 and 1976 Polka Dots held a 125cc National Motocross Race with legendary riders Marty Smith, Bill Grossi and Bob the Hurricane Hannah. Over the years we have made many additions, flat track, TT track and a small camp ground area. Polka Dots Motorcycle Club was started by a small group of men that loved every part of motorcycle racing, whether it was Motocross, Dirt Track or Hare Scrambles. And over 40 years later, the club is still run by a group of men that live and breathe motorcycles. You see, Polka Dots Motorcycle Club is a non profit organization, It’s not about the money, it’s about the love for the sport.